What is Lottery Syndicate Club? 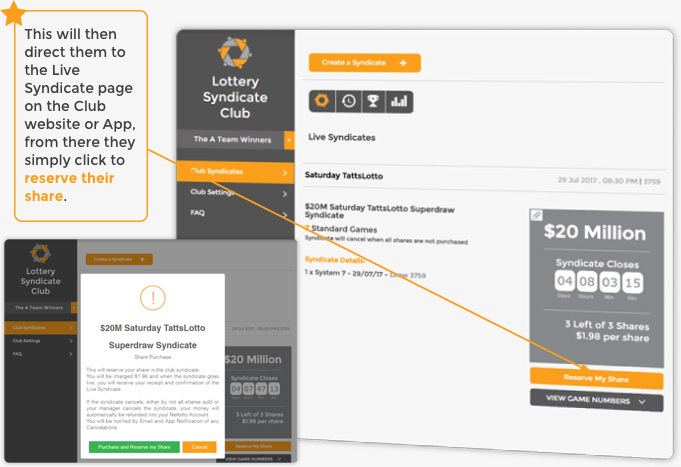 How does Netlotto Lottery Syndicate Club Work? How do I invite members to Join my Club? How do I create a Syndicate? How do members pay for their share? Can I Cancel a Syndicate? What happens if a Member Leaves the club? What happens if I want to Close my Lottery Syndicate Club? Why do I have to join Netlotto to play? Netlotto has provided its members a great new way to enjoy their favourite lotteries, by allowing them to form together into clubs, and enjoy the benefits of playing together. Syndicate Clubs can also play more games than a normal player by sharing the cost across the club members, more games = more chances to win. It's easy to Set up and Run your own lottery syndicate club with Netlotto. Choose someone to be the manager, they must be registered as a member on the Netlotto website. The manager then creates a Syndicate Club- giving it a really cool name ! The manager then invites the people who wish to be a part of the club, emails will be sent out with a link to join, or the manager can provide the club code to enter on the Join screen. Once everyone has joined up, the manager will create the club's lottery syndicate, with the shares divided by the number of club members ready to play. Each member can then purchase their share from their own Netlotto player account. Once all shares are taken place, the Syndicate will go live, each member will get an email copy of the game and numbers, plus,it's always available to view online in your Netlotto Player account. Once the draw has taken place, and the results are finalised, each member will get a results email, indicating any winnings the club has made from the syndicate, and each member's share of the winnings will be automatically deposited into their own Netlotto Player account. Simple and Automated - no waiting around to collect money, no hassles getting the tickets purchased and storing them, and best of all - Automatic winnings back to each member of the club, so no messy payouts. 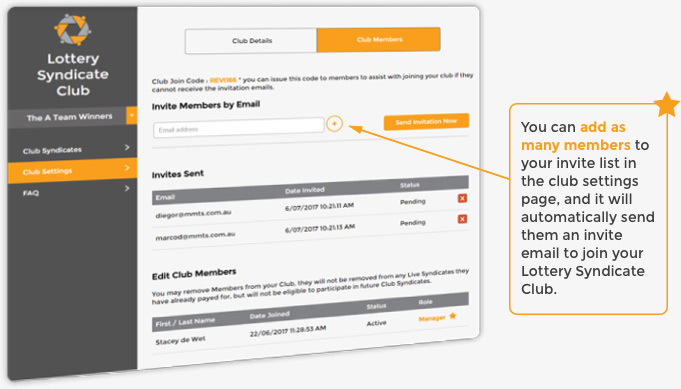 Inviting Members to your club is as easy as sending an email. Each member will need a valid email address to join Netlotto and to receive their notifications and results emails. If for whatever reason a member is having trouble receiving the invite email, there is a join code you can also use, the member can enter on the join section on the club home page. Once you have all of your members invited, you can start to create your Lottery Syndicate Club Syndicates. 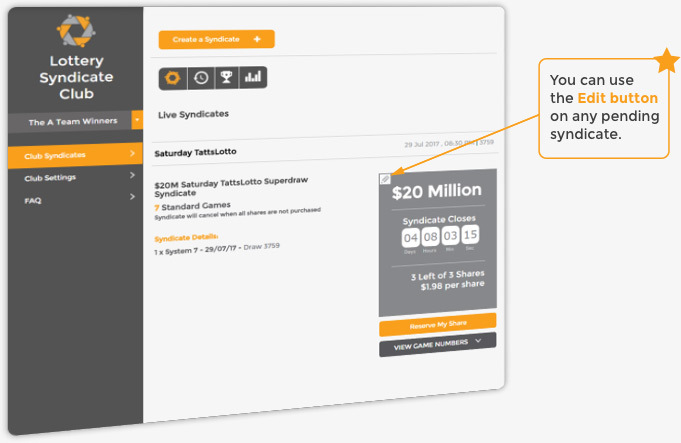 Each Syndicate you create will automatically divide the shares by the number of members in your club. Try to make sure everyone has signed up to the club and has added a payment method before lauching your first syndicate. 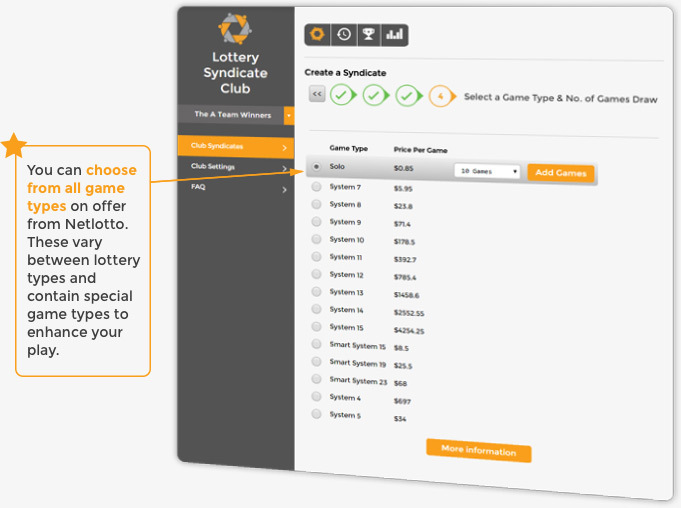 The syndicate Creator, will take you through the 4 simple steps to make a syndicate for your Lottery Club. With this option selected, you will purchase any unsold shares as a manager. All winnings from these shares will be paid ONLY into your Netlotto account. This feature is used to stop syndicate from cancelling when not all shares have not been sold. With this option selected, the syndicate will automatically cancel when all shares are not purchased by the draw close. All payments will be automatically refunded into Club Members Netlotto accounts and an email notifying them of the cancellation will be sent. You can add additional lotteries at the end of Step 4 if you want to create a multi lottery syndicate. Step 4 is time to pick the type of games you would like to have in your Lottery Club Syndicate. While members are buying the shares, the syndicate will show in the live syndicate screen, when all shares are purchased the syndicate will go live and all members will receive a game receipt with the games and numbers on the email. All Club members will be notified every time a new Club Syndicate is created. They will then confirm their payment, from the approved payment method they have on their Netlotto player account. Yes, you can cancel a syndicate as long as it has not gone Live. Live Status on Syndicate means it has now been lodged and cannot be recalled, reversed or cancelled. All Live Syndicates must play. This will then cancel this syndicate, and refund all share purchase amounts back onto the club members Netlotto player accounts. When a member quits your club, the manager will receive an email advising that a member has left. Any live Syndicates that the member was in will still play, and that member will still be eligible for any winnings from the live syndicates he purchased shares in. The manager may close the club at any time. All pending syndicate that have not gone live, will refund all share purchase back to members Netlotto player accounts. All Live syndicates will still play and return any winnings onto Netlotto player accounts. Closed Clubs cannot be reopened. Why do I have to join Netlotto to play ? All Syndicate Club members need to join NetLotto to be able to participate in the Syndicate Club. This ensures we can provide all our normal secure services to members, and to ensure we provide the best experience for our players. 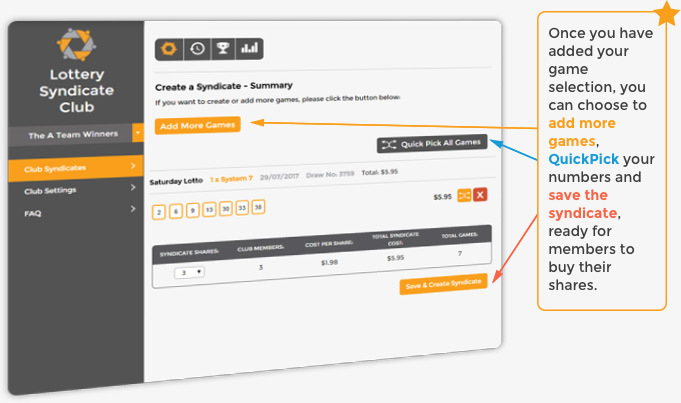 It also ensures that we can Auto payout syndicate winnings direct to players, which is a big advantage to managing your syndicate club.